Learn more about art in progress - a monument honoring the People of the Road, workers who built the locomotives and rail cars that took Milwaukee’s name across the country. Public art invigorates public spaces and helps to engage the community. It draws people onto the Trail, creates a recognizable identity, and links the landscape to the history, architecture, and social fabric of Milwaukee. Art can be used to tell our story, honor our history, or explain an environmental concept in a creative and engaging way. It can create a more inviting space, for what may seem to some, an unfamiliar space. Over time, several pieces of artwork have been developed specifically for the Hank Aaron State Trail. There are also several interesting pieces within an easy bike ride or walk from the Trail. Please enjoy photos of the artwork on this website, but better yet, see them in person. View the Art Concept Plan. The Friends of Hank Aaron State Trail's Art Committee, working together with Write Now! Consulting and La Dallman Architects, developed an Art Concept Plan to encourage and lay the groundwork for the placement of public art along the Trail. The Plan is a flexible framework that guides the way artists, donors, public officials, Friends, and other members of the community think about public art and how it can be incorporated into the Trail. The Plan includes sites along the Trail that are appropriate for placement of art. It is not the intention that all sites be filled and undoubtedly there are others that may be perfectly suited for art, but were not mentioned. Enjoy the Plan and enjoy the Trail and if you feel you would like to know more about future placements of art along the Trail or you would like to make a donation to support more art along the Trail, please contact us. In 2010, artist Chad Brady's concept was selected to embellish the walls of the Valley Passage, the new tunnel linking the Hank Aaron State Trail and the adjacent Silver City neighborhood. The mural was completed in 2011. The high visibility walls illustrate what can be experienced on the opposite side, and at the same time honor the history of the area and celebrate the nature that will continue to flourish in the newly re-created spaces around the Trail. A national request for qualifications brought in many applicants, which were pared down to four artists/teams that underwent a vigorous indoctrination and tour of the Trail, Menomonee Valley, and surrounding neighborhoods. Concepts were then developed by the four artists/teams and submitted for selection to the community. Chad Brady's concept was the overwhelming choice. FOHAST commissioned artist Kathryn E. Martin to create a gateway sculpture to the River Loop Trail at Emmber Lane and Canal Street. Her piece, "A Place to Sit," is inspired by a quote from local historian John Gurda who characterized European settlement in Milwaukee as a wild "game of musical chairs" leaving the Native Americans with "nowhere to sit." Katie offers three high-backed chairs engraved with the names of tribes who made Milwaukee their home, honoring the spirit and people of Wisconsin’s Native American tribes. The sculpture was installed in 2009. View the event summary from the blessing and dedication of A Place to Sit. The River Loop between 13th Street and 25th Street is an alternative to the parallel path along Canal Street, and offers a more secluded trail along the Menomonee River. Art and informational signs can be found throughout the Valley, but the River Loop contains the most concentrated number of art pieces. Near "A Place to Sit," Trail users can view large gears which were once used to lift the original bascule bridge that crossed Emmber Lane. The current bridge is shown in the background. A mural developed during a Milwaukee Institute and Design (MIAD) public art class in 2006, "March On" by Katrina Motley, became inspiration for future murals. To honor the 40th anniversary of the Milwaukee open housing marches led by Father James Groppi, FOHAST worked with area schools and community groups to create public art along the Trail’s Menomonee River Loop, between 13th and 25th Streets. Members of the Organization of Chinese Americans - WI chapter and artists with Danceworks, Inc. and the Wisconsin Art Therapy Association led teams of volunteers in stenciling symbols representing peace and unity along the trail to lead trail users to the location of the student murals. In addition, Artists Working in Education, Inc. developed an art project connecting children to the history of the open housing marches along with their own hopes for the future by creating Dream Flags, which depicted the child's dream for him/herself, family and/or community. The art enhanced segment now draws many more users to this section of the Trail. Inspired by the 40th Anniversary of civil rights and a particular march across the Sixteenth Street bridge crossing the Menomonee Valley, children from neighboring schools developed murals for River Loop section of the Trail in 2007. The project was not only educational, but inspired efforts by others to further embellish this section of the Trail now known as the River Loop. The murals, which feature messages of hope from Chief Joseph, a prominent leader of a Nez Perce tribe, and Mexican hero Benito Juárez contrast with the barbed wire on the fence. Read more about Milwaukee's Civil Rights Marches and the River Loop at Milwaukee Neighborhood News Service's article, "Hank Aaron State Trail has Historic Murals." 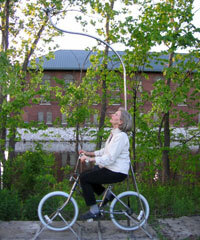 A piece called Bird Bike, developed by artists Brigit Quinn and Emily Belknap, makes an interesting commentary on the combination of nature and biking along the Trail. The interactive piece was developed as part of a Milwaukee Institute of Art and Design (MIAD) public art class in 2007. This shelter is located on the west end of the Trail on Bluemound Road near the intersection with the Oak Leaf Trail. FOHAST reclaimed history and the era of Milwaukee's original streetcar system through the restoration and installation of these architectural gems in the Historic Third Ward at Catalano Square, near the 25th Street Roundabout on Canal Street, and near the intersection of the Oak Leaf Trail near Underwood Creek. FOHAST funded the restoration and siting of the structures which were constructed by City of Milwaukee employees in 1929 and were originally street car shelters on the Sixteenth Street Viaduct. The gazebo at 32nd Street, designed by artist Peter Flanery as a Millennium Art Project by the Merrill Park Neighborhood, acts as a gateway, rest spot, and information location. The gazebo marks the connection between the Valley and the Merrill Park neighborhood to the north. Historic elements, such as gears and railroad spikes and track were integrated to artistically enhance the structure. The gazebo hosts an interpretive sign describing the Valley’s historical connections to its surrounding neighborhoods, and a boulder whose inscription explains that the word “Menomonee” means wild rice. Other boulders can be found beneath the 35th Street viaduct at Canal Street and throughout the Merrill Park neighborhood. 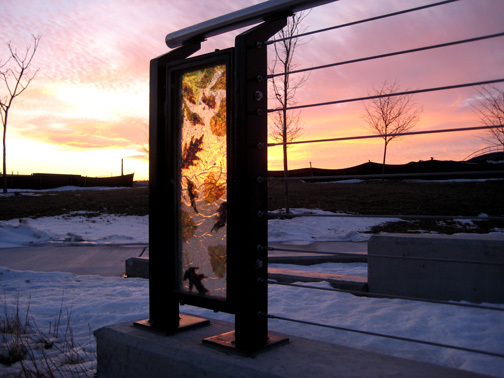 The incorporation of art glass panels developed by artist Kathryn Lottes honoring native plants and creatures were an additional feature that added beauty and interest to railings in the Menomonee Valley Community Park west of 35th Street. "Bridge" is composed of 20 local glacial boulders, selected by the artist, Peter Flanary, for form and color, and averaging two feet in diameter each. The artwork relates to the Menomonee Valley landscape, and explores the idea of "connection" in broad and various ways. This sculpture is located in Three Bridges Park near The Domes Bridge.View a video of the sculpture's assembly. Other elements along the Trail are not purely art, but are more artistically fabricated or designed. A traditional state park sign seemed out of place within the broad spectrum of historic industrial remnants and newly developing modern buildings. Artwork designed, fabricated, and erected by 10th grade students at Milwaukee High School of the Arts, in collaboration with Milwaukee Institute of Art and Design, is installed along the Trail at the equivalent of 88th Street. The following themes were reflected in the sculpture: industries and production, the Manhattan Project, State Fair rides, the railroad, and veterans. These themes were chosen to illustrate the rich history of West Allis, which is where the sculpture is located. Items such as the oil pump, the wrench, and the roller skate speak to the industry and manufacturing which was so vital in West Allis’s past. Components of the nuclear bomb were fabricated at the Allis Chalmers factory in West Allis; this is represented by the hard hat, the atom, and the number 1945. This was included because not many people are aware that Milwaukee was involved in the Manhattan Project. The carousel horse, ferris wheel, and roller coaster point to the fun of the State Fair, whose present location is West Allis. The dog tags, silhouette of the soldier, state of Wisconsin, and eagle were chosen to honor the Veterans of Wisconsin who served our country. The Veterans Administration hospital is located in West Allis. The final pole expresses the transition of the railroad, formerly at this site, to its current function of a bike path. This pole features a railroad track, a train depot, and a traditional looking railroad crossing sign in which one of the crossbars has been renamed “bike path”. Great attention to design and cost went into the creation of engaging informational signs along the Trail. Twelve of the signs designed by Nancy Aten can be viewed here.